There are two portable pellet grills that are very popular on the market right now: Traeger TFB29LZA vs Green Mountain Grill. Both of these two models are primarily used for home cooking, traveling, and tailgating. However, there are several differences that set these two models apart, and they also come with different highlighted features. On one hand, Traeger TFB29LZA Junior Elite boasts an advanced thermostat control panel for precise heat adjustment and easy clean-up. On the other hand, Green Mountain Grill Davy Crockett features a smart thermal sensor and built-in Wi-Fi. So, how do these two pellet grills compare against each other, and which one does provide the best value for the money? Traeger TFB29LZA Junior Elite is not too big. The size is just right for small households as well as traveling and tailgating. With a weight of 60 lbs, two people can lift the grill from the ground without much of a problem, so loading it into your truck shouldn’t be a problematic issue. Two of the four legs are equipped with wheels for easy transport. 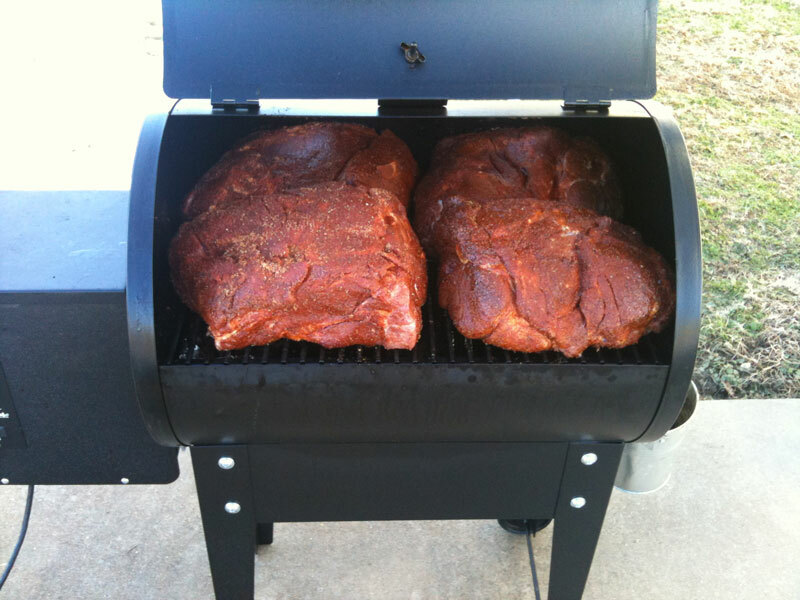 Nevertheless, if compared to the Green Mountain Grill, Traeger TFB29LZA is indeed bigger and bulkier. The dimensions are 36 inches (height) x 37 inches (width) x 18 inches (depth). And it is not foldable at all. So, for storage and traveling, you will need to plan carefully the space needed by the grill. If you want a fully foldable grill, see Coleman Roadtrip LXE vs X Cursion! On the other hand, Green Mountain Grill Davy Crockett is neat and nice because of two reasons: the overall dimensions are not as large, and the legs are foldable. When fully unfolded, the grill measures 31.75 inches tall, 34 inches wide, and 23 inches deep. When the legs are folded, it becomes even more compact at 20.5 inches tall, 27.75 inches wide, and 17.5 inches deep. It is easier to bring along when traveling and tailgating. Well, despite the more compact size, Green Mountain Grill Davy Crockett is actually heavier. It weighs about 68 lbs. It may need two people to be lifted from the ground or moved safely, as it has no wheels. When choosing a new grill, especially one that you will bring along on your picnic trips, the build quality is a factor that you have to consider seriously. You need something that is durable, able to last even in demanding conditions. And, you may also want it to look nice in order to boast it in front of your friends. 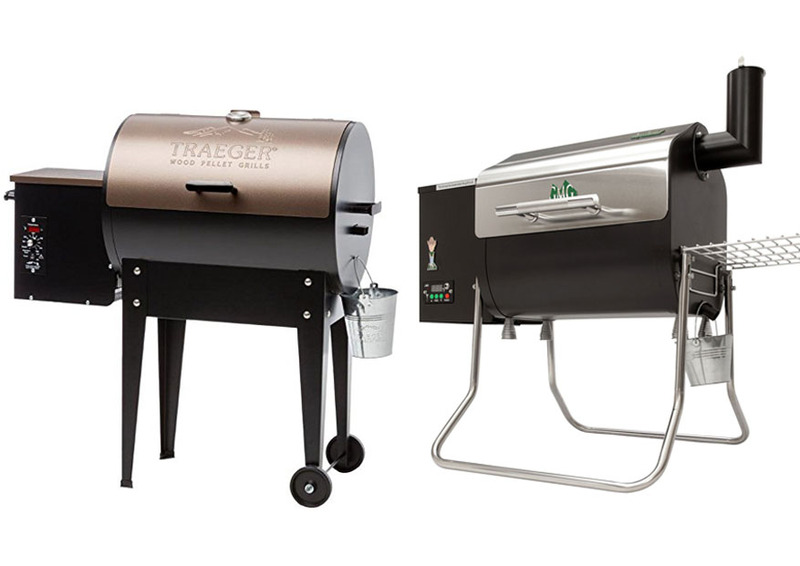 Between Traeger TFB29LZA vs Green Mountain Grill, many people will agree that the Traeger grill is the better-looking model. Frankly, it appears like a grill of premium quality. The cooking box is constructed from thick metal, and seems to be very sturdy and durable. The lid is colored in a brownish copper color, which enhances the look of the grill. The legs are also very durable. However, there have been some reports saying that the metal box of that contains the hopper and fire box isn’t really strong. It can be dented by a strong impact. Well, make sure that you secure the grill safely so that it won’t get bumped and knocked around, and you are good to go. Green Mountain Grill Davy Crockett is a grill with modern features, but the appearance isn’t really impressive. The build quality is good; it is also made from thick, durable metal. The triangular-shaped lid is a nice touch. But, the whole silver-and-black color theme isn’t very eye-catching. 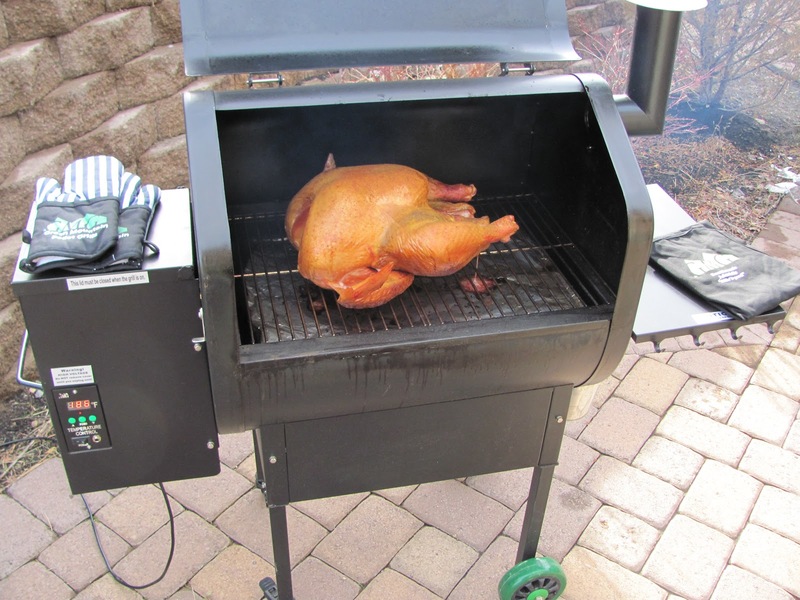 Traeger TFB29LZA vs Green Mountain Grill come with different sets of features. Depending on your need and preference, you may find one better than the other. Traeger TFB29LZA Junior Elite features a digital multi-position LED control panel. Well, you may need a little time to really understand how it works, but it will be very quick and convenient once you get the hang of it. The LED display shows accurate temperature readings, and there are multiple settings for different heat levels. But the coolest feature of all would be the Auto Shut-Down Cycle. Once you have finished cooking, you can set the grill into the shutdown cycle to make the induction fan run for ten minutes in order to get rid of the residual ash in the fire pot before shutting off. This feature makes cleaning much easier. On the other hand, Green Mountain Grill Davy Crockett is coming with cool digital and connectivity features. The highlighted feature is the built-in Wi-Fi, which enables the grill to be controlled remotely. Simply connect the grill to your home network, and download the mobile app on your smartphone. Afterward, you can start and stop the grill, adjust the temperature levels, even when you are on the go! Parents with babies also find this feature very useful, as it enables them to perform “remote cooking” while taking care of their children. You can also create multiple cooking profiles and set a timer so that you won’t have to change the settings all the time. The digital control panel also looks cool and neat. The grill is equipped with a meat probe to provide accurate food temperature readings rather than just the temperature of the room inside the cook box. How do Traeger TFB29LZA vs Green Mountain Grill compare in terms of performance? Do they really cook well? On one hand, the Traeger TFB29LZA Junior Elite has received lots of positive reviews because of the excellent performance. The auger consistently draws hardwood pellets from the hopper into the fire pot, and the convection heat cooks very evenly and encases the food in flavorful smoke. It is also very energy-efficient; it uses 300 Watts only in the first four minutes. Afterwards, it only consumes 50 Watts for the rest of the cooking duration. On the other hand, Green Mountain Grill Davy Crockett’s strong point is the highly accurate temperature control. The thermal sensor is very accurate, and it enables you to control the heat levels more precisely. The grill also has even and stable cooking power. In addition, this grill is also versatile when it comes to the powering; the grill is equipped with adapters for three power options, allowing you to use a 100V source, a 12V battery, or the cigarette lighter in your car! The grill doesn’t really consume very much power, so don’t worry about depleting your car’s battery. Traeger TFB29LZA Junior Elite is protected by a three-year warranty, which covers all malfunctions and damaged parts or pieces. However, keep in mind that the warranty will be void if use any other pellets than Traeger pellets! Make sure that you make use of the warranty whenever you have a problem while still in the warranty period. Green Mountain Grill Davy Crockett also comes with a full factory warranty, but it only goes for two years. Although these two grills come with different advantages, in the end, we recommend you to choose Green Mountain Grill Davy Crockett. For the money, it provides great value. The Wi-Fi features and digital functions are very useful in various situations. The performance and build quality are also good. This grill is also more compact and portable, and it is very versatile that it can work with three power options.